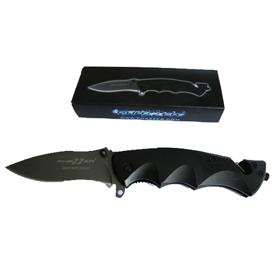 PhaZZer® Knife - Small » Protective Solutions, Inc.
High quality knife with suggested uses for utility purposes, survival and emergency type situations. The small knife has a smooth blade; the larger knife has both smooth and serrated blade sections. 440 stainless steel blade for corrosion resistance and ability to hold an edge. Spring-assisted opening, locks open securely. Features a belt or back cut blade under the handle.